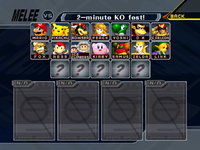 A starter character is a character who is already available for play immediately after turning the game on for the first time; the player does not have to unlock, challenge, or download that character in order for them to be selectable (as one must do to select unlockable characters and downloadable characters). Super Smash Bros. 64 starters. Super Smash Bros. Melee starters. Super Smash Bros. Brawl starters. Super Smash Bros. for Nintendo 3DS starters. Super Smash Bros. for Wii U starters. Super Smash Bros. Ultimate starters. 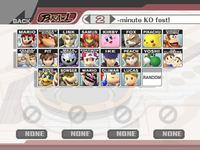 The starting roster is comprised of the original 8 starter characters from the first game. The eight starter characters of Super Smash Bros. are the only playable characters to remain starter in every installment they appear in. Samus is the only female character to remain a starter in every installment she appears in. Ness, Captain Falcon, Luigi, Jigglypuff, Ganondorf, Marth, Toon Link, Lucario, and Sonic are the only unlockable characters to become a starter character in a later installment. This also counts Bowser Jr. between the 3DS and Wii U versions of Smash 4. Ness is the only one to do so twice, as Captain Falcon has done so thrice. 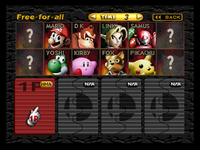 Super Smash Bros. for Wii U is the only installment in the series where all of the original 12 characters appear as starters. Smash 4 is the only game to feature third-party characters as starter characters. This page was last edited on April 17, 2019, at 14:15.